So researchers at Northwestern University sought to find out how attending religious events is associated with weight gain over time. They analyzed data from the Coronary Artery Risk Development in Young Adults study, which followed more than 2,400 people aged 20 to 32 for 18 years. Over that time, the scientists reported at an American Heart Association conference, people who went to church or church activities at least once a week were more than twice as likely as people with no religious involvement to become obese. This is a salient study for Sikhs for several reasons. First, people of Indian origin (which includes most Sikhs) are statistically more prone to cardiovascular disease and diabetes, and so we need to be more cognizant about our diet. Many Sikhs are also regular worshippers at their local Gurdwara and engage in many of the activities there on a consistent basis. Third, and most significantly, the study brings to mind one of the most fundamental practices at every Sikh place of worship. Langar is the vegetarian meal that is served at the end of the traditional Sikh Gurdwara [service]. At the Golden Temple in Amritsar, India, and at all Gurdwaras in the world, langar is open to everyone and thousands of people are fed daily through this sacred and generous tradition. All of the food and preparation is donated. Everyone sits together in rows on the floor facing each other with an aisle down the middle. Those who serve the meal walk down the center aisle and serve everyone a portion of the meal. As key as langar is to the Sikh religion, its current practice is gaining some attention as we have learned more about healthy eating in recent decades. Langar – especially in the west – has evolved into something that hasn’t kept up with the times. 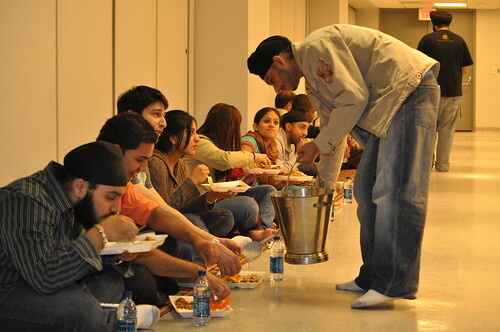 Langar was always intended to be a simple meal to connect us to humility, and in many Gurdwaras it still is. But, in the west, a simple, healthy meal at a Gurdwara is the exception. The volunteers that prepare langar have become increasingly (and often competitively) enthused about providing delicious meals that the congregation would enjoy, but such pride in feeding the worshippers well may be doing some harm along with the good. But everytime I go to the Gurdwara, I succumb to the lure of khand vali cha [sugar tea], and the plethora of tasty but artery-clogging food laid out right next to the non-biodegradable Styrofoam cups, plates and plasticware. Lunchtime langar is also sometimes made using healthier oils, but the point is, this is still not healthy food. Clearly, there is an awareness about the nutritional quality of the food we’re serving in our Gurdwaras. Navdeep Singh, in his post, goes on to discuss these challenges. We should make every effort to encourage Gurdwaras – with their already built-in practice of offering meals to its congregation – to pick up on this mandate. When we talk about making our Gurdwaras more relevant to today’s society, this is an exciting way to do it.